Lennox Healthy Climate PureAir X8789 (5 pack) PCO16-28 MERV 16 replacement filter fits the PCO16-28 PureAir unit. Dimensions: 17" x 26" x 5" Actual 16.31" x 25.47" x 4.31" The Lennox Healthy Climate PureAir replacement furnace filter uses a MERV 16 pleated filter to capture particles in the air stream. In most home environments, this filter only needs to be replaced every 12 months. 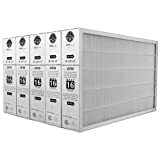 Actual Size: 16.31" x 25.47" x 4.31"
Lennox X8789 MERV 16 Filter - 16" x 26" x 5" (5 Pack) out of 5 based on ratings.